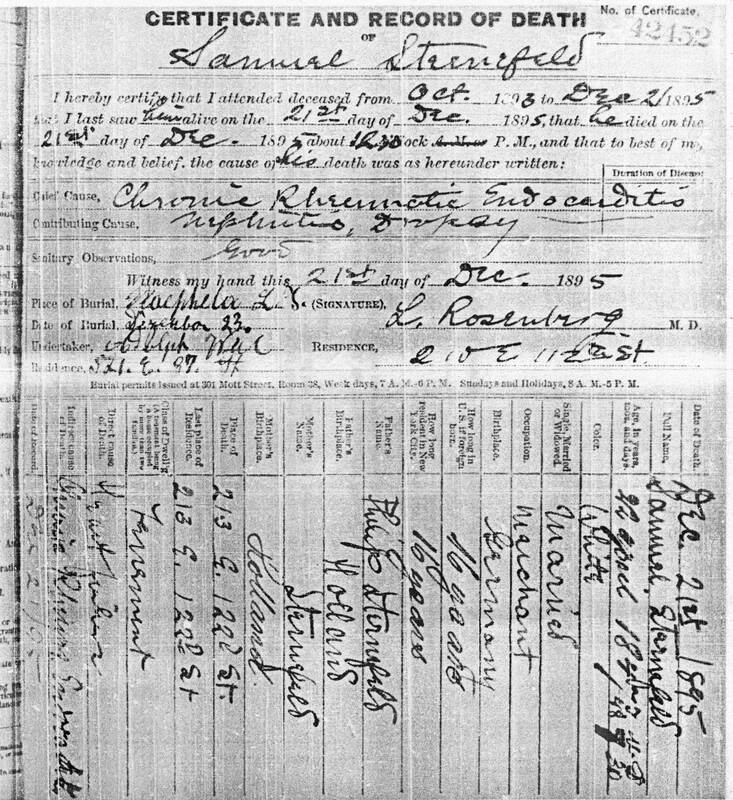 Samuel Sterneveld was born 22 Apr 1847 in Zutphen, Gelderland, Netherlands to parents Philip Sterneveld, a baker, and his wife Sara Spier (the Spiers were one of the largest jewish families in Zutphen). Samuel was 2nd in a family of nine children, only out-ranked by his sister Betje. 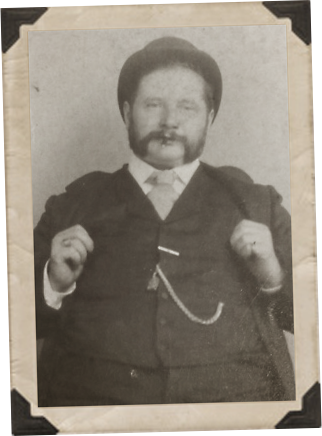 Samuel had, in total, six sisters: Betje, born 1844, Aaltje, '49, Mina, '51, Jeanette, '53, Rika, '56, & Rebekka, '58, and two brothers: Jacob, born 1855 and Emanuel, '60. 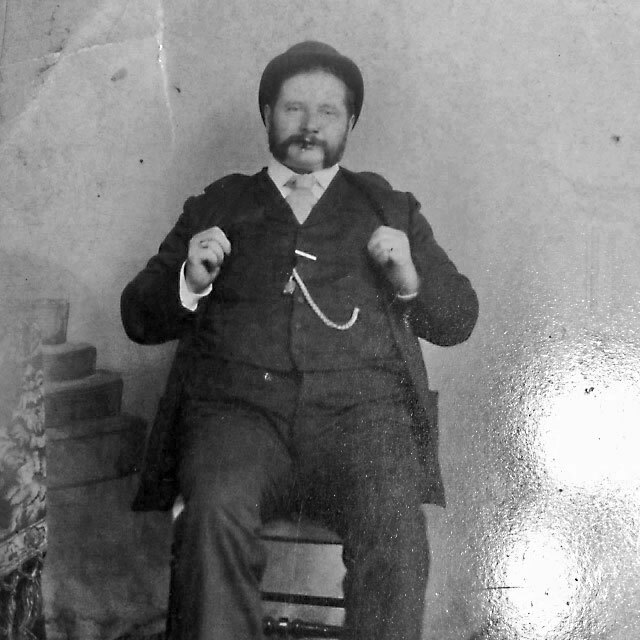 Samuel spent the first 12 years of his life in the small Jewish community in Zutphen, which had in the neighborhood of 400 inhabitants around the time of Samuel's birth and at it's height in 1875 was home to roughly 600 Jews. 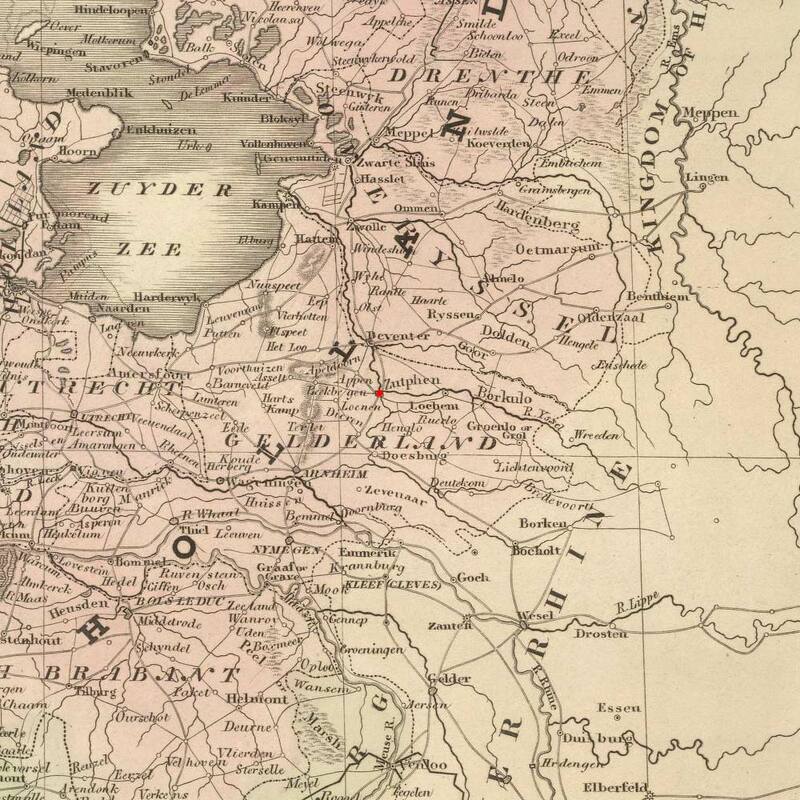 On the 30 June 1859, the Sterneveld family moved to Crefeld, Rheinland, Preußen (now Krefeld, North Rhine-Westphalia, Germany... 130 km from Zutphen). 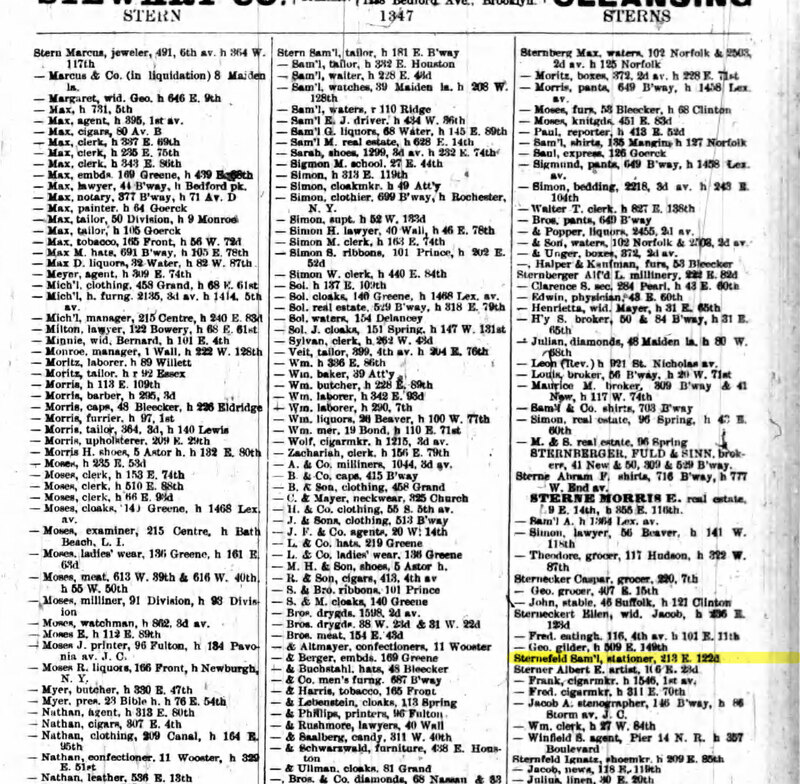 This move was documented in the Zutphen population register and is backed up by documents confirming Rebekka's birth in Zutphen in 1858 and Emmanuel's birth in Krefeld in 1860. I believe the Sterneveld family lived in Krefeld well into the 1870's. At this point I assume Samuel married wife Bella Trennlich in Krefeld about 1878 (Samuel's sister is married in Krefeld in 1879, hence my belief the entire family continued to reside here). At some point Samuel left for Frankfurt, Germany. Whether that was after marriage or before, I don't know. 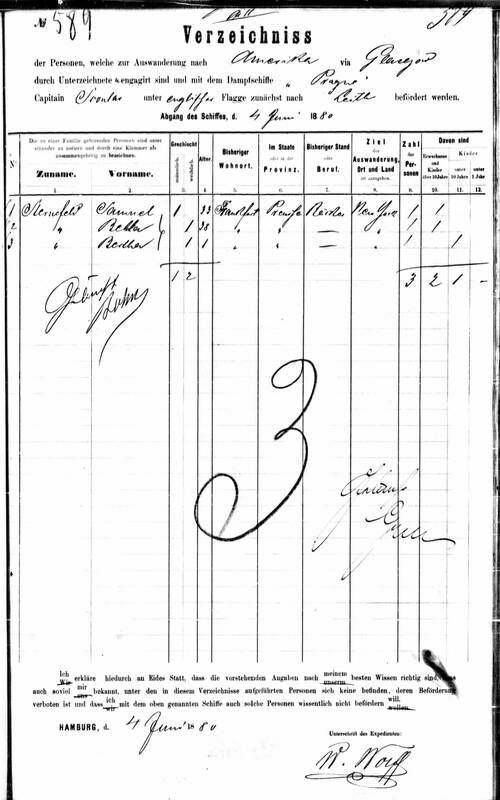 On the 04 June 1880, Samuel, wife Bella, and their daughter Bertha who was born in October 1879, departed from Hamburg, Germany. Samuel, who was a baker, sailed out of Germany aboard the S.S. Prague. 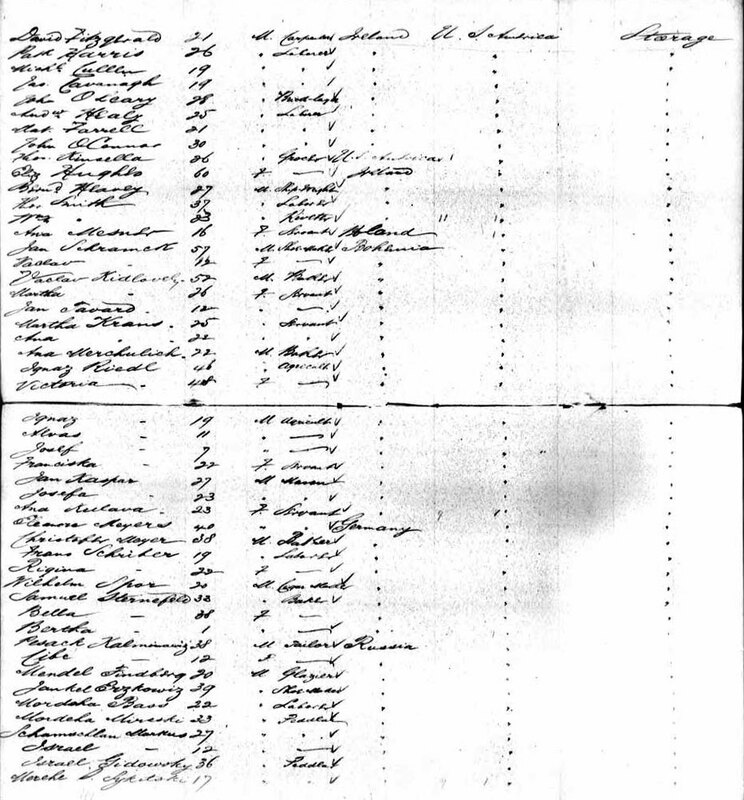 According to the manifest, the ship visited the ports of Glasgow and arrived at Leith. Here the family departed the ship and made their way, by land, to the ports of Barrow & Dublin. Once in Dublin the family acquired passage aboard the S.S. Columbia and set sail for their final destination: New York City. Samuel was listed as 33 years old, a baker from Germany and sailing with wife Bella and 1 year old daughter Bertha. Some time in the years following their arrival, wife Bella would pass away, either due to childbirth or living conditions (or both), which were usually rough for recently immigrated families living in New York City. 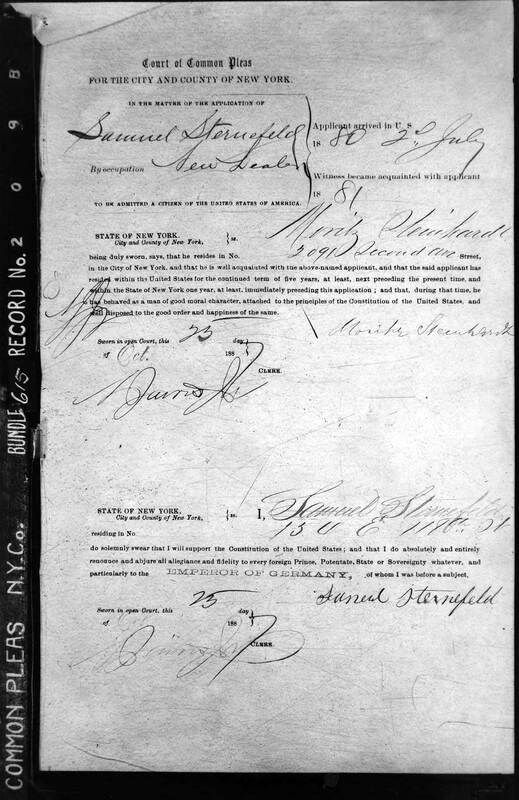 On the 04 March 1883, Samuel married Babetta "Barbara" Scheierman in Manhattan, New York. Babetta was also a recent immigrant arriving about 7 years prior. Babetta welcomed their first child, daughter Sadie, on 18 Nov 1883 in Manhattan. By the following year, Samuel and family were living at 948 First Avenue in Sutton Place in Manhattan while Samuel was working as a baker. 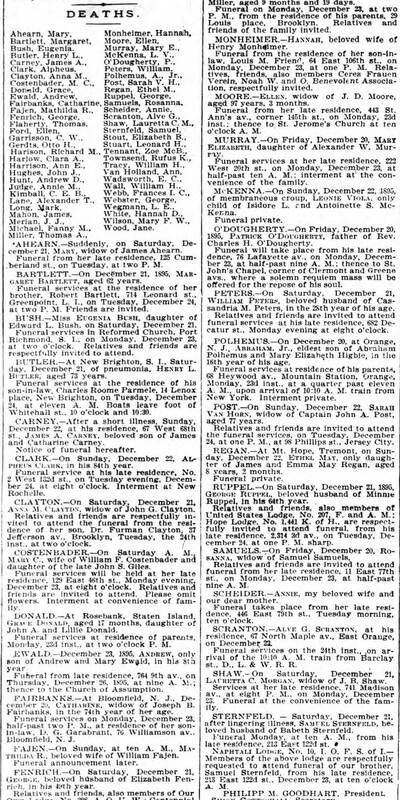 A boy, Emil, followed on 22 Jan 1886 while the family was living at 2195 Second Avenue in East Harlem and then another daughter, Jennie, in Feb 1887. 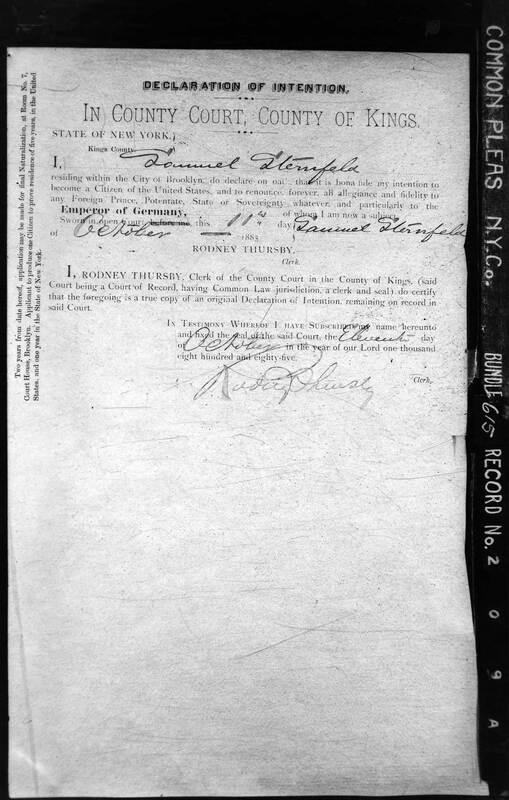 Samuel was granted his American citizenship on 25 Oct 1887 in the New York City Common Pleas Court. The family was living at 154 E 118th St. in East Harlem area of Manhattan at the time. 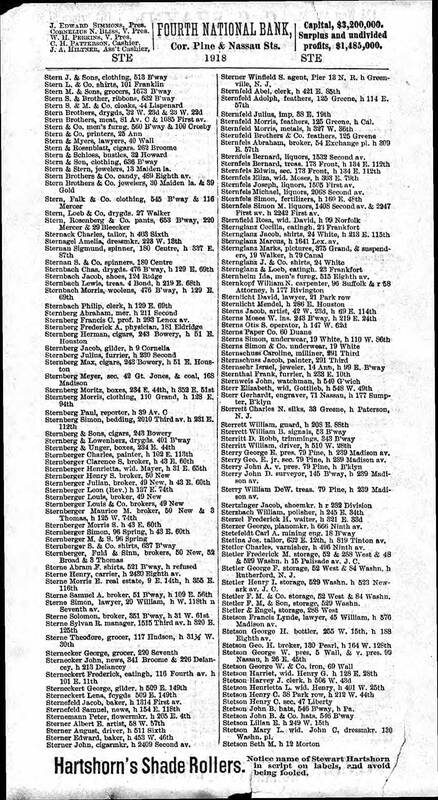 Samuel is noted as living at that same address in Manhattan in the 1889 city directory when his occupation is identified as "News" or News Dealer. It's likely a daughter Hattie was born in 1889/1890 and dies 18 April 1895, however proof of this relation has yet to be recovered (A record request needs to be made with state of New York). Samuel's youngest son Philip was born 24 Jul 1891 in Manhattan at the family home at 217 E. 122nd Street in East Harlem. By 1894 the Sternefeld family changed residences again. This time to what seems to be next door at 213 E. 122nd Street. 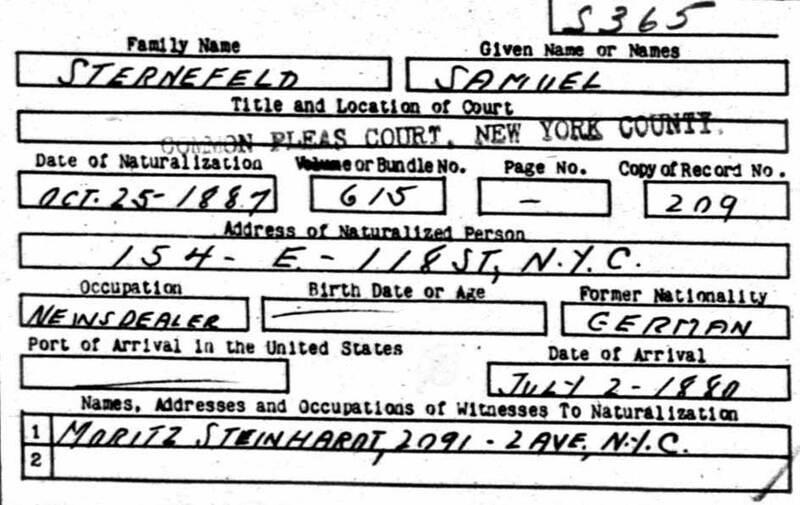 Samuel Sternefeld died there in Manhattan 21 Dec 1895 after what the New York Herald wrote was a lingering illness. He was buried at Machpelah Cemetery in Ridgewood, Queens. Philip Sterneveld, 04 Jul 1812 - ? Sara Spier, 28 Jun 1818 - ? A Both ships Samuel sailed on, the SS Prague and the SS Columbia are hard to find record of. Both ships had more popular ships in later years by the same name, and in part of the Columbia, it had two. One was a steamer in the 20s and another was the first ship Edison used electricity on in 1880, however neither were immigrant ships. Samuel moved to Frankfurt before leaving for America. Was this before or after marriage? When and where was daughter Bertha born? Frankfurt? Was Hattie (~1890-1895) the daughter of Samuel and Barbara or from brother Jacob's family? 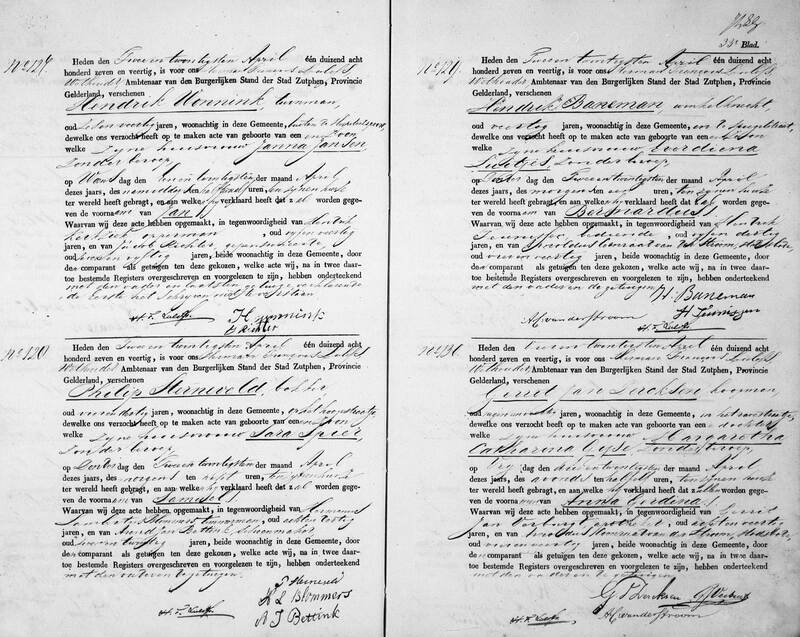 Were Samuel & Jacob the only 2 Sternefelds to immigrate to America?